A warm winter has made for great fishing! For the most part, we’ve had a tremendously warm winter and the bite has been just as hot. The weather has stayed in the mid 70’s up to the mid 80’s all throughout this winter and it has made for some really pleasant days on the water as well as provided us some great fishing. There have been a couple of cold fronts that shut the bite down for a few days at a time but for the most part, this has been a really great winter as far as the fishing and the weather has gone. The speckled sea trout fishing has been phenomenal. It’s absolutely amazing at how big our average fish has gotten since the red tide 7 years ago put a damper on things. The numbers are better than ever and the size is more impressive than I can remember. The best bite for trout has been on the really low tides around the new and full moons. They drop off into low troughs and cuts around Anclote key and make it easy for us to find them. 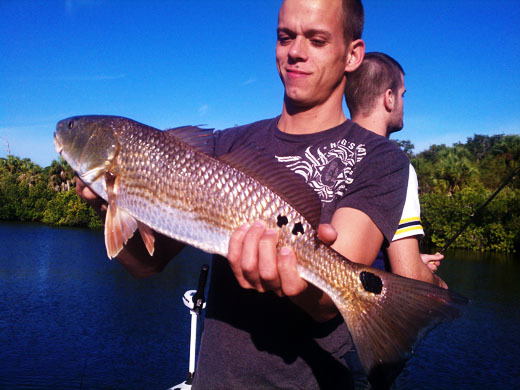 The redfish bite has has stayed strong, especially on the high tide from the Anclote river all the way up to Hudson. The areas just north of the Cotee river has really been productive. Most of the creeks and coves in these areas have held good keeper sized fish. Keep in mind that we need to hit these area on high water as the whole area is very shallow. Snook are generally taking their normal break this time of year but we’ve had a few surprise catches of tarpon and cobia in the last week or so. The one tarpon we caught was caught on a live, free-lined shrimp and looked to weigh about 20lbs. It was a really cool surprise as we rarely ever catch tarpon this time of year. Sheephead have invaded the flats and though we don’t target them much, we’ve had some great by-catches of 3-5lb fish. They taste great and are great fighters in shallow water. Many people don’t realize what a great fishery we have here in the winter time. The trout fishing on our coast is some of the best in the whole country. I’m often asked, “I know it’s winter, but, is there anything to catch this time of year?” I answer with an emphatic, “Yes!” This is the only time if year where we have days of catching 75-100 trout; all keeper size or better. The redfish are still cooperating and you never no what other surprise might be awaiting at the next fishing spot! This is an awesome time of year to fish here. Don’t mis your chance to get out on the flats during this mild winter! Be sure to give me a ring to discuss your next fishing adventure.